These all are footer middle settings for current post. Footer Middle Skin:Choose your footer middle skin has “Custom” or “Themes Default”. If you select default, custom options are hide and not working. Footer Middle Font Color:Select your footer middle font color for current post page. Footer Middle Background:Choose your footer middle background for current post. Footer Middle Link Color:Select your footer middle link color for current post page. Option link Regular, Hover, Active. Footer Middle Border:Set your footer middle border settings for current post page. 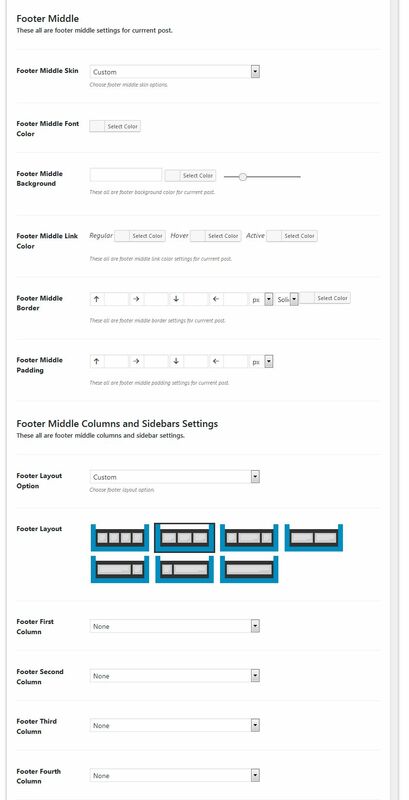 Footer Middle Padding:Set your footer middle padding settings for current post page. These all are footer middle columns and sidebar settings. Footer Layout Option:Choose your footer layout option has “Custom” or “Themes Default”. If you select default, custom options are hide and not working. Footer Layout:Select your footer layout for current post. Footer First Column:Choose your footer first column for your current post. Available items like ( none, sidebar, secondary menu sidebar, footer1 and footer2). Footer Second Column:Choose your footer second column for your current post. Available items like (none, sidebar, secondary menu sidebar, footer1 and footer2). Footer Third Column:Choose your footer third column for your current post. Available items like (none, sidebar, secondary menu sidebar, footer1 and footer2). Footer Fourth Column:Choose your footer fourth column for your current post. Available items like (none, sidebar, secondary menu sidebar, footer1 and footer2).